Yes, that's a sad pterodactyl and a protagonist in a chicken suit. Fresh off the Greenlight voting floor, Commander Cool 2 from Orlyapps is gunning for the title of Coolest Game of 2015. And by "gunning", I mean actually using guns to hunt down a time traveling scoundrel who's tearing through history like I tear through a three cheese burrito. 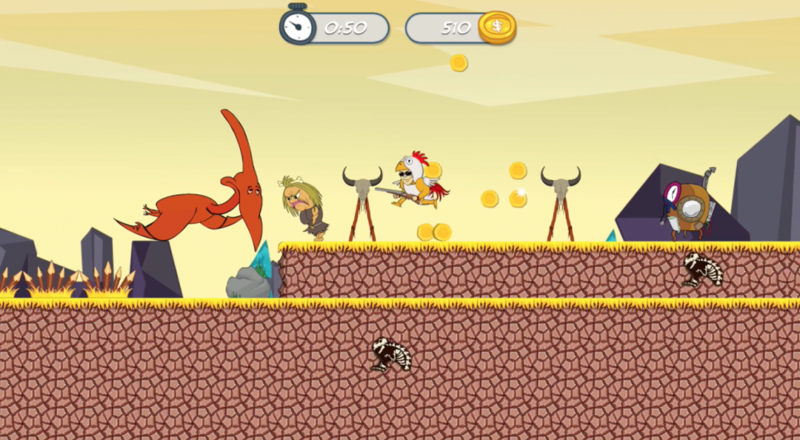 Commander Cool 2 is a sidescrolling shoot-all-the-things platform game that features lots of prehistoric/pirate enemies, lots of items, and some really wild weapons. You look at something like the VW-21.2 Volcano Weapon and you think "Yeah, that'll kill some baddies." Then you look at the RS-182 Rainbow Spitting Unicorn and you suddenly realize there are whole new levels of destruction you have never before considered. And because you get to shoot through the stone age, the age of pirates, and in the future, everything is suddenly much... well, cooler. No gun-wielding trip through time is complete without a few friends. Commander Cool 2 opens the door for some four player local co-op action that lets you jump and shoot all the things together. Missions encourage everyone to adopt a similar play style for the best score, switching between ninja-like stealth rounds to Rambo-style shootathons and speed runs. There's even a deathmatch and "smash" mode for those days you just can't seem to work together. Commander Cool 2 has been greenlit by the Steam community with two years of development under its belt. A playable alpha demo is available, and the team hopes to reach beta in the next few weeks. Page created in 0.9367 seconds.